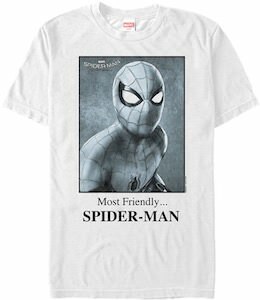 If you like a cool superhero t-shirt then you should check out this most friendly Spider-Man t-shirt. The white t-shirt shows a black and white portrait of Spider-Man like he would have looked in his yearbook and below the image it says “Most Friendly…. Spider-Man”. You can get this Spider-Man t-shirt in men’s t-shirt Small – 3XL and it is made from preshrunk cotton. Now you can wear a Spider-Man t-shirt that makes you wonder how friendly he really is. Marvel superhero’s are popular and by wearing this t-shirt you may becoming more popular too if that is important to you.